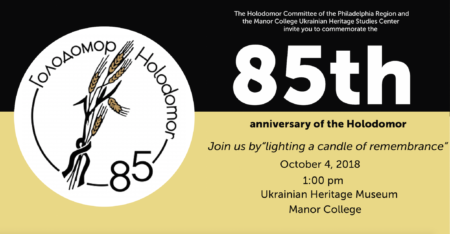 On October 4, 2018, Manor College is holding a commemoration for the 85th anniversary of the Holodomor, the man-made famine in Soviet Ukraine from 1932 -1933 that killed millions of Ukrainians. The remembrance will be held in the Ukrainian Heritage Museum at Manor College at 1:00 pm. This event is open to the community. Manor College strives to foster appreciation for its Ukrainian heritage and culture; The College was established in 1947 by the Sisters of Saint Basil the Great, Jesus Lover of Humanity Province, a Byzantine Ukrainian order of the Eastern rite. Manor College wants to reverently acknowledge those that were affected by the Holodomor.